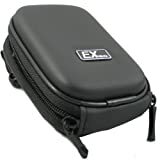 Ex-Pro Clam Digital Camera Case / Pouch – Keeping your unit safe, scratch free. Inlcudes neck strap with adjustment and clips and belt clip carabiner. Quality Genuine Ex-Pro branded case. Ex-Pro Clam shell Adjustable, detachable shoulder strap, Fits a wide range of digital camera’s. To fit camera of maximum dimensions :- L 10cm x H 7cm x D x 3cm. Rugged and affordable, offering ultimate protection to your camera in a clam shell smooth finished. Available in several vibrant colours & patterns, search “Ex-Pro Clam” for our full colour range, Silver, Silver, Black Blue, Green, Orange & Pink to suit your mood or even the colour of your camera ! Exceeds all competitors in this field at this price for this quality – compare this case to major brands for your money. 2 Year Ex-Pro warranty. Often copied but never beaten Ex-Pro claim shell range are lined with a soft material to prevent scratching on your camera and have an internal pocket to store batteries or memory cards. The Ex-Pro® clam case offers the ultimate protection to your camera from bumps and scratches ! All camera cases come with a neck strap making it easier to carry around, the strap can also go around your shoulder making your camera more secure whilst out or use the belt clip carabina also included with your purchase. Colour of the product purchased is designated in the image and the title line. Ex-Pro® claim shell range are lined with a soft material to prevent scratching on your camera and have an internal pocket to store batteries or memory cards. Several colours and various designs matched to your camera. Fits Nikon L2, L3, L4, L6, L10, L11, L12, L14, L15, L16, L17, L18, L19, L20, L21, L22, L23, L24, P3, P4, S1, S2, S3, S4, S5, S7, S9, S50, S50c, S51, S51c, S52, S52C, S60, S70, S80, S100, S200, S200, S203, S210, S220, S225, S230, S230, S500, S510, S520, S550, S560, S570, S600, S610, S620, S630, S640, S700, S710, S1000, S2500, S3000, S3100, S4000, S4100, S4150, S5100, S6000, S6100, S6150, S6200 & More. Fits Fuji A100, A101, A120, A150, A160, A170, A180, A201, A202, A203, A220, A230, A235, A303, A310, A345, A350, A360, A370, A510, A400, A500, A600, A610, A700, A800, A820, A825, A850, A860, A900, A920, AV100, AV110, AV120, AV130, AV140, AV150, AV180, AV200, AV2300, AV250, AX200, AX230, AX245W, AX250, AX280, AX300, AX350, F10, F11, F20, F30, F31, F40, F40fd, F450, F45fd, F46fd, F47fd, F60fd, F70EXR, F470, F47fd, F480, F50fd, F60fd, F70EXR, F72EXR, F72 EXR, F80EXR, F85EXR, F100FD, F200EXR, F440, F455, F460, F610, F650, J10, J12, J15fd, J20, J22, J22, J25, J25, J27, J28, J29, J30, J32, J37, J38, J40, J50, J100W, J110W, J120W, J150w, J200, J210, J250, JZ300, JZ310, JZ500, JZ510, JX200, JX210, JX250, JX280, JX300, JX400, JX530, JV100, JV110, JV150, JV160, JV170, JZ305, JZ505, T200, T300, M603, V10, XP10 , XP11, Z1, Z2, Z2fd, Z3, Z5,, Z5fd, Z10fd, Z20, Z30, Z33wp, Z35, Z37, Z70, Z71, Z80, Z90, Z100fd, Z200fd, Z300, Z500, Z700, Z700 EXR, Z800, Z800EXR & More. This entry was posted in Discount Photography and tagged Black, Camera, Case, Clam, CR277G, Digital, ExPro, Hard, proof, Shock by Ball Photo. Bookmark the permalink.